HIBS are to mark the 50th aniversary of being the first British club to enter the European Cup by playing their first opponents, Rot-Weiss Essen, it was revealed today. Tony Mowbray’s side will travel to Germany to play a commemorative friendly in the Georg-Melches Stadium on Friday, July 22. 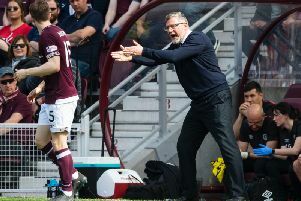 The Easter Road boss believes the game will be an important part of his pre-season plans with Hibs having already announced a three-game tour of the Republic of Ireland at the beginning of July. He said: "The fixture against Rot-Weiss Essen will be good preparation for our UEFA Cup campaign. The experience of playing against a German club in German will be good for the players. The fact the match commemorates such an important landmark in the history of Hibernian Football Club makes it all the more special, especially for our fans." Hibs defeated Rot-Weiss Essen 4-0 away in 1955, in the first round of the inaugural European Cup and drew 1-1 in Edinburgh before beating Swedish outfit Djurgaarden, only to lose to French side Reims in the semi-finals. Rot-Weiss Essen have fallen on hard times in recent years having not competed in the Bundesliga since 1977. They dropped to the German regional leagues in 1997. They returned to the German second division however last year only to be relegated again. The Georg-Melches Stadium was first built in 1919 and currently has a capacity of 23,500 - with 19,000 of those places given over to fans who want to stand. While ticket prices for the game against Hibs are not yet known, a guide for Easter Road fans planning to travel to Germany is that prices for the season just ended were set at e5 for standing places and e20 for seats. Meanwhile, Hibs kid Steven Notman has been drafted into the Scotland Under-19 squad for their UEFA Championship qualifying campaign which begins against Greece in Austria tonight.